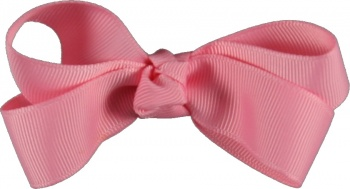 This is the perfect little pink bow. It is 22 inches of pink grosgrain ribbon that is 7/8 inches wide. There is 2 loops on each side and no tails on this bow. This is the perfect size for the side of the face look or get two for piggy tails. The center has the same ribbon in a french knot and is attached to an alligator clip.